By: Katie Andrews, with Thanks to Mrs. Krassioukova-Enns, Ms. Diane Driedger, and Mr. Jim Derksen. Henry Enns was a pioneer of the Canadian disability rights movement, a catalyst behind the international human rights movement and a wonderful storyteller. Henry became a wheelchair user at the age of nineteen after having contracted rheumatoid arthritis four years prior. His consequent list of professional accomplishments is long, however, perhaps the most notable of his achievements is that the set backs he was dealt early in life did not dampen his zest for life nor his desire to make a difference. 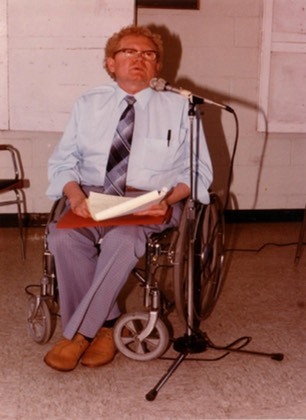 His long time friend and colleague, Jim Derksen, claimed that Henry simply had, “A vision and sense of what was right and what should be.” This clear sense of “what should be” led Henry to fight for disabled rights at the local, national and international levels, with thousands rallying behind him. Henry earned his Bachelor of Arts from the University of Winnipeg in 1966, followed by his Bachelor of Social Work in 1978 from the University of Manitoba. According to his wife Mrs. Olga Krassioukova-Enns, Henry had an inherent love of learning- both inside and outside of the classroom. He kept a file entitled “Interesting Articles” in which he kept any articles, stories or other items that he found noteworthy. Mrs. Krassioukova-Enns claimed that, “He was a perpetual student in his life. He was always reading.” His “contagious enthusiasm” drew people to him and naturally thrust him into a position of leadership. He was a well-learned and experienced intellectual, who used his knowledge and experience to ultimately set the foundation for the recognition of disabled rights worldwide. Henry’s “contagious enthusiasm” served him well in every aspect of his life, and led to his refusal to take a simple “no” for an answer. Another long-time friend and colleague, Diane Driedger, related the following story, which was one of Henry’s favourites to recount himself and quite amply describes Henry as a person. Due to his refusal to simply accept things as they were and his vision of “what should be” Henry went on to become involved with the Manitoba League of the Physically Handicapped (MLPH) in 1976, becoming the Provincial Chairperson of MLPH in 1977. At the same time he founded a national self-help organization called the Coalition of Provincial Organizations of the Handicapped (COPOH). He was a pioneer of the Canadian Centre on Disability Studies, which is an institution that is devoted to the research and information dissemination of disability issues. In 1979, Henry read about the American Independent Living Movement in an American Journal and decided, along with his long-time friend Jim Derksen, that there should be a Canadian equivalent. This led to the first Independent Living Centre in Canada, which opened in Kitchener, Ontario in 1982. The movement soon spread throughout the country, leading to the establishment of the Canadian Association of Independent Living Centres (CAILC) in 1985, of which Henry Enns was a founding member. Henry additionally served as a Voluntary Service Worker with the Mennonite Central Committee Canada (MCC). His work with the MCC focused on the self-help movement of disabled persons; his particular assignment being making Mennonite churches aware of access issues for disabled persons. In 1980, Henry saw the need for an international disabled rights organization that was run by disabled individuals for disabled individuals and was consequently elected Chair of the Steering Committee to start such an international organization at the Rehabilitation International Conference in Winnipeg. This led to the creation of Disabled Peoples’ International (DPI) in Singapore in 1981. DPI was charged with the mandate of attaining and sustaining the rights of full participation and equality for disabled persons worldwide. Henry served as DPI’s Deputy Chairperson, Chairperson and Executive Director at different times throughout the 1980s and early 1990s. His vision for and dedication to DPI resulted in the far reaching organization that exists today. Henry’s strong vision of how things should be, led to his significant contribution to the drafting of the UN World Program of Action concerning Disabled Persons. This contribution was later invaluable in the drafting of the United Nations Convention on the Rights of Persons with Disabilities (CRPD), which came into force in 2008 and has been signed by 146 nations. Henry and DPI were awarded the United Nations Testimonial Award in 1989 in recognition of this work. Henry also received an Honorary Doctor of Laws from both Queen’s University of Kingston (1992) and the University of Manitoba. Henry’s wife, Mrs. Krassioukova-Enns claimed that, “He taught me and my son to treat life as the greatest gift.” He was a believer that the road not taken was inherently better. Mrs. Krassioukova-Enns, asserted that whenever they came to a new road they had to take it because there were simply more stories to be told about the scenic route. He took this approach in his professional life as well, as is made evident by his remarkable list of achievements. He was a natural leader because he believed that every contribution was important, no matter how small or seemingly insignificant. He always used to say that, “You cannot walk your dreams alone,” and he applied this mantra to his everyday life, by encouraging others to contribute in any way possible. He was a true believer in everything that he did and worked hard as a result. His strong vision for tomorrow was coupled with his understanding that change does not come about easily, however, he was willing and able to work hard to ensure that it did. According to his longtime friend, Jim Derksen, “He was convinced his effort would not be wasted,” and it is evident that his belief was not misplaced.